The Redwood RB5 Beginners Electric Bass Guitar is a solidly built workhorse that provides a comfortable model to hone your skills on, but is just as able in satisfying the demands of more experienced players. The RB5 is built in the style of a classic double-cutaway style, which is endowed with curves in all the right places to maximise playing comfort. The ergonomically designed edges give the RB5 delightful playability, whilst the lightweight feel and balanced weight distribution across the neck and body reduces fatigue. The bevelled edges remove any discomfort so that whether you wear it high or low, you are treated to a snug feel every time. Alder has been employed as the tonewood of choice, which gives the RB5 a sweetly balanced timbre from low to high. Whether you're seeking rumbling lows, punchy mids, or crisp highs, the RB5 duly obliges. Alder resonates freely, which allows the bass to generate a healthy amount of energy with a confident output. The paintwork is protected by an oversized pickguard around the pickups and controls. The neck has been fitted to the body using a bolt-on construction, giving it a secure feel, which allows you to play with the confidence that the neck will match you every step of the way. The neck is set along a 34-inch scale length, giving it ample length to generate masses of sustain. Paired with the neck is a smooth blackwood fingerboard, home to 21-frets that sound out with energy and articulation. The Redwood RB5 electric bass guitar has a simplified electronics’ setup that consists of a split single-coil pickup in the middle position, and is controllable via master volume and tone pots. Do not underestimate the versatility of this setup. The balanced timbre of the alder is represented perfectly, whilst subtle adjustment of the volume and tone pots can yield a wide array of tones. The secure hard tail bridge keeps the strings fixed in position, whilst the nut and tuning machines work together to uphold string tension, and tuning integrity. Whether you prefer to play gently, or attack the strings vigorously, you can rest assured that the RB5 can capably deal with any and every onslaught. 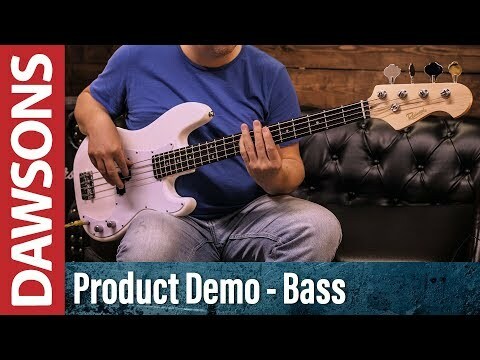 The Redwood RB5 Beginners Electric Bass Guitar is proof that an instrument that plays well, sounds great, and is built to last, need not cost the earth. Thanks to the carefully considered appointments and attention to detail, Redwood have managed to create an instrument that is beneficial to both beginners and experienced players alike. Body is alder, but is 1/4" thinner than an actual P-Bass, so feels weirdly light. Spec says 3-ply pickguard; is actually bevelled single ply. All in all, I'm happy - it feels sturdy and will certainly last long enough for me to save to upgrade to a "F" branded one.